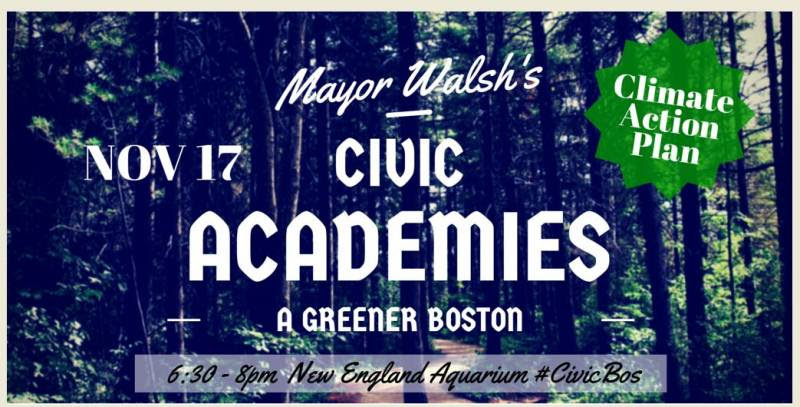 Mayor Walsh's Civic Academy returns for a second session. This time examining the city's environment and energy department's work on creating a Climate Action Plan for the City of Boston. In a continued effort to bring more transparency and accessibility to city government, Mayor Walsh created the Civic Academy Program; with the goal of delivering a wider range of information to all residents in Boston, representatives from various departments as well as cabinet members will be in attendance to answer questions and engage with residents. Please call the Mayor's Office of Neighborhood Services with any questions or concerns about the Civic Academy Program at 617-635-3485.